If you’re a poker player you undoubtedly know that Omaha Poker is the second choice next to Texas Holdem for players at poker room tournaments and cash games. Texas Holdem is so popular that even James Bond favored it over his preferential game of Baccarat in the 2006 remake of the 1967 movie, Casino Royale. All the other action is the same as in Texas Holdem. There are five community up cards dealt by the house dealer between betting rounds: three called the flop, one called the turn and one more called the river. The size of the pot grows quickly because the four hole cards allow for more drawing hands. Players often see the hands to the end of the betting rounds because the two card choice is not made until the final hand is played. In that the drawing hands are more frequent, opponents also have hands that they are more likely to bluff with. Double suited hands with high cards such as a Jack, King of spades and an Ace, Queen of diamonds are favorites due to the flush possibilities. Unfavorable hands at pre-flop can include three of a kind and two pair because only two of the cards can be used in the final round. Another version of this game is called Hi-LO Omaha, which is played exactly the same as PLO except the pot is divided between the winners with the highest ranking hand and the lowest ranking hand. 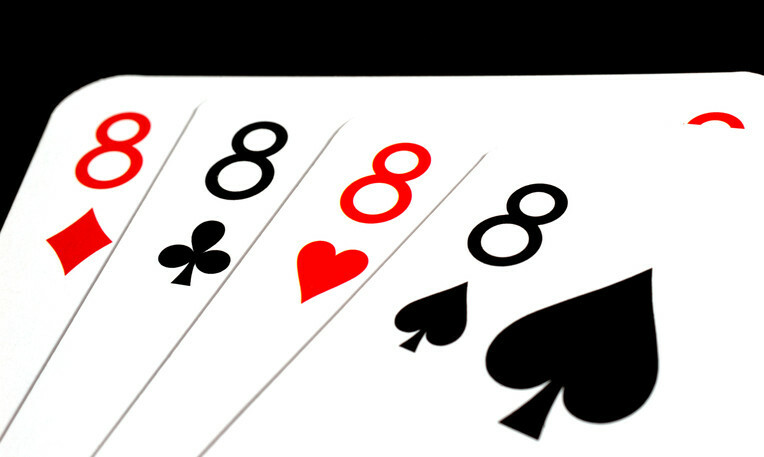 A winning low ranking hand cannot contain any pair or a card higher than an eight. Also, a straight with ace through five can be used to win a high or low hand. Additional publications about Omaha, casino gaming, and other products can be found on Amazon. Click on the link(s) below to purchase.